Moissanite is one of the rarest minerals found in nature, and Charles &amp; Colvard® have made it their mission to share its beauty and brilliance with the world. Charles &amp; Colvard’s experts have recreated moissanite in a lab to deliver you an artfully crafted, socially responsible and eternally brilliant gemstone. 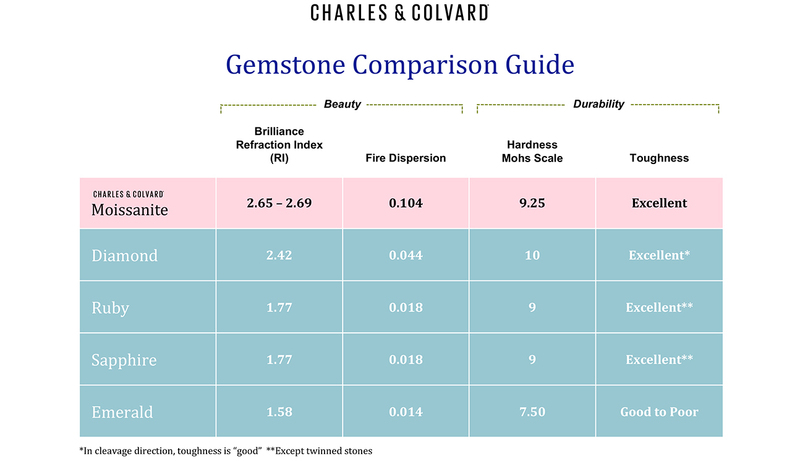 All Charles &amp; Colvard® are naturally pure, without aftermarket treatments or enhancements and with a Refractive Index of brilliance measuring 2.65 – 2.69, each possesses an intrinsic fire that dazzles and delights. The above wording is courtesy from Charles &amp; Colvard®.